Made it to Bangkok this morning and received my first taste of 24/7 rush hour. Three lanes of traffic occupied five, six, seven wide by buses, trucks, cars, tuktuk’s, you name it–not to mention millions of motorcycles whizzing between lanes and on the sidewalk. The pace is erratic at best. This place is intense, beautiful, surreal and intimidating. Courtney Allen–who used to work for me at Idahostel–and her boyfriend, Stephen, live in Bangkok. I will surf their couch for the next few nights. We rendezvoused for dinner and drinks following a nerve racking rally across this city of 8 million on the Green Hornet. Getting the bike parked away in a garage was perhaps the most relieving experience of the trip thus far. 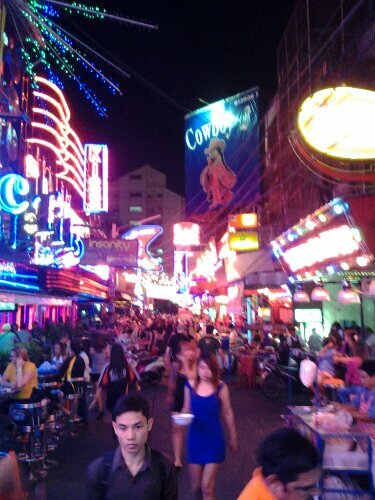 Contrary to popular belief, Bangkok is not a seedy, lawless place. It is, in fact, a productive, tickytack city with incredible representations of wealth and prosperity throughout its core. True, it does come off as chaotic to the casual observer, and reasonably so. 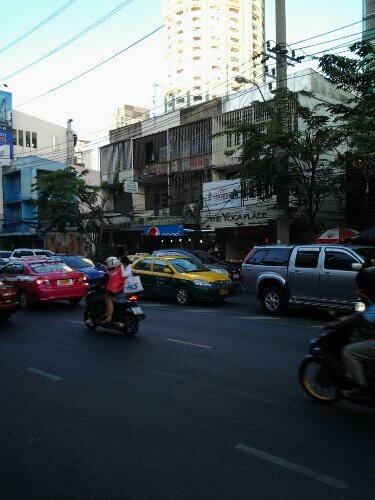 But I found it interesting that despite to intensity of traffic, hustle and flow, etc. that Bangkok is a very organized place. It takes a while to see it, but soon enough it becomes apparent that the people here do not yell and scream at each other, they do not push, they do not shove. They simply operate amidst the most miniscule margins between success and disaster. Spatial ability–a miserly 6 inches, tops. It is an opportunistic reality, but one that works. Following a filling meal of lamb, rice, beef and Singha beer, we mosied across town on Bangkok’s elevated light rail. A quick walk through one of the city’s red light districts to check out the elder European males in their recreational pursuits, and we landed on a comfortable hookah patio for a few quiet drinks. We rapped over life, travel, and philosophy until what seemed like closing time. But nothing evers seems to close here. You simply decide that you are done and go home. Posted in Transworld TourTagged bangkok, transworld tourBookmark the permalink.